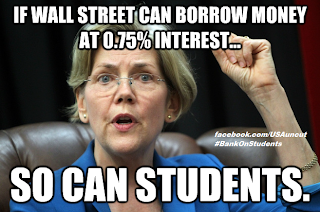 Sen. Elizabeth Warren has just introduced legislation that will let students borrow money for college at the same rock-bottom interest rates that the Big Banks get. The bill would would students who are eligible for federally subsidized Stafford loans to borrow at the same rate the big banks get through the Federal Reserve discount window. "In other words, the federal government’s going to charge interest rates nine times higher than the rates they charge the biggest banks; the same banks that destroyed millions of jobs and nearly broke the economy." "Our students are just as important to the economic recovery as our banks." "Let's face it: Banks get a great deal when they borrow money from the Fed." "In effect, the American taxpayer is investing in those banks."